Hornby, a UK-based model company, is set to release a collection of eight 3-inch figures depicting British troops in Afghanistan along with various vehicles including tanks and helicopters. 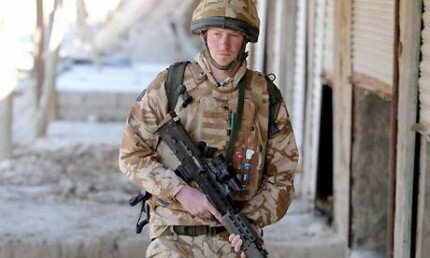 Interestingly enough, one of the troops being modeled is Prince Harry. More specifically, a famous picture of him on patrol in Helmand Province in 2008 is being used as the basis for the figure. Although his uniform and equipment will be featured on the model, his likeness will not. The collection will be available in February, 2012. This entry was posted on Tuesday, September 20th, 2011 at 12:00	and is filed under Media, Military, Toys. You can follow any responses to this entry through the RSS 2.0 feed. Both comments and pings are currently closed. Hot Toys 1/6th scale British Tank Commander figure bears a striking resemblance to Prince Harry down to the way thePronce has been seen carrying his Browning Hi Power, tucked into the PALS webbing on his plate carrier. Tanks? we don’t have any tanks in Afghanistan…….some tracked vehicles yes but tanks (Challenger 2) no.